Y'all (/jɑːl/ yahl) is a contraction of you and all (sometimes combined as you-all). It is usually used as a plural second-person pronoun, but the usage of y'all as an exclusively plural pronoun is a perennial subject of discussion. Y'all is strongly associated with Southern American English, and appears in other English varieties, including African-American English and South African Indian English. Y'all arose as a contraction of you-all. It first appeared in the Southern United States in the early nineteenth century, with an earliest citation of 1824. Many aspects of the word's derivation are unknown; for example, no one knows if its use began with southern black people or with white immigrants. One supposition is that the term evolved from the earlier Ulster Scots term ye aw. Scots-Irish immigrants to the Southern United States frequently used the term ye aw. Some evidence suggests that y'all could have evolved from ye aw due to the influence of African slaves who may have adapted the Scots-Irish term. An alternative theory is that y'all is a calque of Gullah and Caribbean creole una via earlier dialects of African-American English. Y'all is an original form, deriving from indigenous processes of grammar and morphological change, not from input from other English dialects. Y'all appeared at different times in different dialects of English, including Southern American English and South African Indian English, and hence it is a parallel independent development in those dialects. The forms ya'll and yall are also known, but the form y'all is the most prevalent in print, being ten times as common as ya'll. Other less-common forms include yawl and yo-all. Functionally, the emergence of y'all can be traced to the merging of singular ("thou") and plural ("ye") second-person pronouns in Early Modern English. Y'all thus fills in the gap created by the absence of a separate second-person plural pronoun in standard modern English. Y'all is unique in that the stressed form that it contracts (you-all) is converted to an unstressed form. The usage of y'all can satisfy several grammatical functions, including an associative plural, a collective pronoun, an institutional pronoun, and an indefinite pronoun. Y'all serves as a "tone-setting device to express familiarity and solidarity." When used in the singular, y'all can be used to convey a feeling of warmth towards the addressee. In this way, singular usage of y'all differs from French, Russian or German, where plural forms can be used for formal singular instances. There is long-standing disagreement among both laymen and grammarians about whether y'all has primarily or exclusively plural reference. The debate itself extends to the late nineteenth century, and has often been repeated since. While many Southerners hold that y'all is only properly used as a plural pronoun, strong counter evidence suggests that the word is also used with a singular reference, particularly amongst non-Southerners. is a cardinal article of faith in the South. ... Nevertheless, it has been questioned very often, and with a considerable showing of evidence. Ninety-nine times out of a hundred, to be sure, you-all indicates a plural, implicit if not explicit, and thus means, when addressed to a single person, 'you and your folks' or the like, but the hundredth time it is impossible to discover any such extension of meaning. The existence of the genitive (or possessive) form y'all's indicates that y'all functions as a pronoun as opposed to a phrasal element. The possessive form of y'all has not been standardized; numerous forms can be found, including y'alls, y'all's, y'alls's, you all's, your all's, and all of y'all's. All y'all, all of y'all, and alls y'all are used by some speakers to indicate a larger group than is necessarily implied by y'all though this form can be considered, in certain parts of the American South, incorrect, as being redundant. All y'all can also be used for emphasis; the existence of the form is further evidence that y'all is considered a fused grammatical form. Y'all has been called "perhaps the most distinctive of all grammatical characteristics" of Southern American English, as well as its most prominent characteristic. People who move to the South from other regions often adopt the usage, even when other regional usages are not adopted. 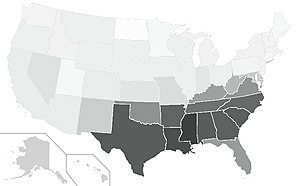 Outside the southern United States, y'all is most closely associated with African-American Vernacular English. African Americans took Southern usages with them during the twentieth-century exodus from the South to cities in the northeastern United States and other places within the nation. In urban African-American communities outside of the South, the usage of y'all is prominent. The use of y'all as the dominant second person-plural pronoun is not necessarily universal in the Southern United States. In the dialects of the Ozarks and Great Smoky Mountains, for example, it is more typical to hear you'uns (a contraction of "you ones") used instead. Other forms have also been used increasingly in the South, including the use of you guys. Overall, the use of y'all has been increasing in the United States, both within and outside the southern United States. In 1996, 49% of non-Southerners reported using y'all or you-all in conversation, while 84% of Southerners reported usage, both percentages showing a 5% increase over the previous study, conducted in 1994. Some speakers prefer "y'all" over "you guys" because the former is gender-neutral. "Y'all" may also connote positive characteristics associated with Southerners such as hospitality. In South Africa, y'all appears across all varieties of South African Indian English. Its lexical similarity to the y'all of the United States is attributed to coincidence. Y'all is found, to greater or lesser degrees, in other dialects of English, including the dialects of St. Helena and Tristan da Cunha, and Newfoundland and Labrador. It is also found in Alberta, Canada, Cornwall and the Philippines. Look up y'all in Wiktionary, the free dictionary. Look up all y'all in Wiktionary, the free dictionary. ^ "Water towers loom large". The Cincinnati Enquirer. April 7, 2001. Retrieved 2010-07-08. ^ a b c d e Crystal, David. The Story of English in 100 Words. 2011. ^ a b c d e f Schneider, Edgar W. "The English dialect heritage of the southern United States", from Legacies of Colonial English, Raymond Hickey, ed. 2005. p.284. ^ a b Montgomery, Michael. "British and Irish antecedents", from The Cambridge History of the English Language, Vol. 6, John Algeo, ed. 1992. p.149. ^ Lipski, John. 1993. "Y'all in American English," English World-Wide 14:23-56. ^ Hickey, Raymond. A Dictionary of Varieties of English. 2013. p.231. ^ a b c Garner, Bryan. Garner's Modern American Usage. 2009. p.873. ^ a b c d e f g Bernstein, Cynthia. "Grammatical features of southern speech", from English in the Southern United States, Stephen J. Nagle, et al. eds. 2003. pp.107-109. ^ a b Hickey, Raymond. "Rectifying a standard deficiency", from Diachronic Perspectives on Address Term Systems. Irma Taavitsainen, Andreas Juncker, eds. 2003. p.352. ^ a b c Lerner, Laurence. You Can't Say That! English Usage Today. 2010. p. 218. ^ Okrent, Anrika (2014-09-14). "Can Y'all Be Used to Refer to a Single Person?". The Week. The Week Publications. Retrieved 2014-09-15. ^ Mencken, H.L. The American Language Supplement 2: An Inquiry into the Development of English in the United States. A. Knopf ebook. Retrieved 2014-10-07. ^ Simpson, Teresa R. "How to Use "Y'all" Correctly". ^ Montgomery, Michael. "Y'all", from The New Encyclopedia of Southern Culture, Vol. 5: Language. Michael Montgomery et al. eds. 2007. ^ Wright, Susan. "'Ah'm going for to give youse a story today': remarks on second person plural pronouns in Englishes", from Taming the Vernacular, Jenny Cheshire and Dieter Stein, Eds. Routledge, 2014. p.177. ^ a b Mesthrie, Rajend. "South African Indian English", from Focus on South Africa. Vivian de Klerk, ed. 1996. pp.88-89. ^ Schreier, Daniel. "St Helenian English", from The Lesser Known Varieties of English: An Introduction. Daniel Schreier, et al. eds. 2010. pp.235-237, 254. ^ Clarke, Sandra. "Newfoundland and Labrador English", from The Lesser Known Varieties of English: An Introduction. Daniel Schreier, et al. eds. 2010. p.85.